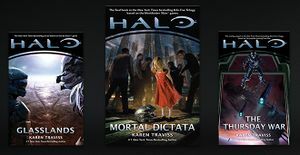 The Kilo-Five Trilogy is a multi-book deal between Tor Books and bestselling writer Karen Traviss taking place within the Halo universe. The series written by Traviss fleshes out the events of the post-war era following Halo 3, the final game in the original trilogy, and tie directly into the story of the Reclaimer Saga and its first installment, Halo 4. The first novel, titled Halo: Glasslands, was released on October 25, 2011. The second novel, titled Halo: The Thursday War, was released on October 2, 2012. The third and final novel, Halo: Mortal Dictata was released on January 21, 2014. In addition to directly continuing the story of the 2006 novel Halo: Ghosts of Onyx, the series introduces new characters and storylines, centering around the eponymous Office of Naval Intelligence black operations team Kilo-Five. Released October 25, 2011, Glasslands explores the volatile political situation in the Halo universe following the end of the Human-Covenant war. Picking up where Halo: Ghosts of Onyx left off, Dr. Catherine Halsey, SCPO Franklin Mendez, and a group of SPARTAN-IIs and SPARTAN-IIIs look for a means of escape from a Forerunner shield world locked in a slipspace bubble in the remnants of the artificial planet Onyx. Meanwhile, Office of Naval Intelligence Commander in Chief Admiral Margaret Parangosky assembles a black operations team known as Kilo-Five, which is assigned on a covert mission to sow discord between disparate Sangheili factions by any means necessary, as well as to arrest Dr. Halsey once she has been located. At the same time, a Sangheili group known as the Servants of the Abiding Truth push for an insurrection against Arbiter Thel 'Vadam and his forces, whom they consider to be blasphemous. Halo: The Thursday War is a direct follow-up to Glasslands. The book was released on October 2, 2012. Recovering from an attack by the Jiralhanae, Dr. Evan Phillips looks for a way to escape his entrapment as Avu Med 'Telcam gears up for an attack against the Arbiter. Kilo-Five must return to Sanghelios to retrieve their fallen comrade before he is lost in the fray, temporarily abandoning another growing priority on the rebel-leaning planet Venezia. Meanwhile Jul 'Mdama looks for a way to escape his confinement inside the enormous shield world and soon learns of an ancient entity that once held a hatred for humanity. All while this is taking place, the UNSC Infinity is set on a course to undergo her first space trials thanks to newly incorporated Forerunner technology. Halo: Mortal Dictata is the third and final installment of the trilogy. It was released on January 21, 2014. Naomi-10's father, Insurrectionist Staffan Sentzke, acquires a CCS-class battlecruiser, Pious Inquisitor, from Kig-Yar pirate Sav Fel. With it, he intends to threaten Earth with glassing in order to coerce the authorities into providing answers about his daughter's disappearance decades earlier. It is Kilo-Five's mission to apprehend Staffan and end his terrorist plots. Kilo-Five must test their loyalties and prevent Naomi's family ties from compromising the mission to stop her father. Meanwhile, Avu Med 'Telcam hires Kig-Yar Shipmistress Chol Von to steal back the Inquisitor, after Fel had stolen it from him. However, Von intends to steal the ship for herself to use it for her united Kig-Yar navy. Halo: Glasslands, the first installment in the trilogy. Halo: The Thursday War, the second installment in the trilogy. Halo: Mortal Dictata, the third and final installment in the trilogy.